Whether you are selling products or services, Salestrekk helps you see what products or services is driving your business. Manage and edit your products or services from one single simple user interface. Are you doing well or not so well? Find who is responsible for it, and lead them in the right direction. Upload a spreadsheet with product details, or add them individually to your convenience. Get a full overview of everything that your business is selling from one page. Classify products into inventory and customize them to your business. Gain intelligence to discover new opportunities based on what is selling the best. Manage all the inventory from this Inventory Pool. Create inventory and assign them to different teams. Inventory will be assigned to different teams depends to where the product is being sold. Etc. Different teams are selling different products from different inventory. As the name suggests, upload a product price list all at once using a simple and convenient spreadsheet. Want to change the pricing of just product? Simple, just hit the edit button and save your new price. Why use a product management tool? Integrates with our Warehouse Management System. 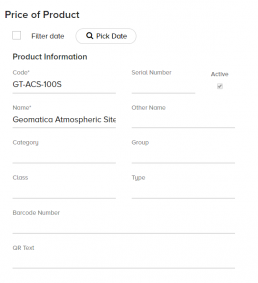 Product tool enable the user to add the products into their inventory and add a price list to them. Using the Product management – able to know which products are selling well and where are they being sold. Help the marketing team to plan for any marketing promotions on products that are rather slow moving.